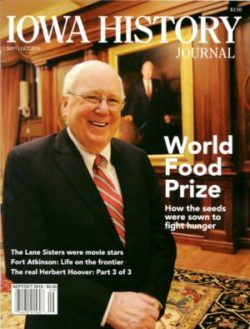 This terrific review of my latest book, “A Culinary History of Iowa: Sweet Corn, Pork Tenderloins, Maid-Rites and More,” from The History Press appeared in the September/October issue of Iowa History Journal. Enjoy! Also, if you’d like to get your own signed copy of “A Culinary History of Iowa” or would like to send signed copies as gifts, click here to visit my online store. I appreciate your support for authors and Iowa-based small business! Iowa has a long and substantial culinary history; far deeper than corn and pigs that are so often associated with our farm-rich state. 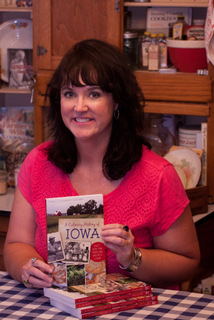 “A Culinary History of Iowa,” written by Darcy Dougherty Maulsby, delves deep into its past, tracing as far back as the pioneer settlers for the story of food in Iowa. From well-known names such as the Graziano Brothers, Blue Bunny ice cream and Maytag Blue Cheese, to hidden gems found in the most unexpected places, Iowa’s food culture is incredibly varied. As the book’s subtitle “Sweet Corn, Pork Tenderloins, Maid-Rites and More” suggests, there are unique flavors to be discovered across the state. The book is an excellent primer on the roots of Iowa farmland, as well as current trends. Beginning with an overview of Iowa’s agricultural value and its products from American Indian traditions through the Great Depression and beyond, Maulsby concisely writes how Iowa history is tied to food creation, proliferation and consumption. The Iowa State Fair is a section unto itself, which befits the food-centric and beloved affair. A diverse gallery of local events (country fairs, sweet corn festivals) and modern confabs (Baconfest) are the beneficiaries of profiles, as well. Finally, the book devotes space to the many long-established restaurants that can be found almost anywhere in Iowa; each with its own story to tell. It’s always fascinating to see history through a different lens, and Iowa’s culinary exploits definitely shine throughout these pages. Iowa has been influenced by many cultures in a variety of ways, but nowhere does that cultural melting pot shine so bright as in the kitchen. Polish, Swedish, German, Dutch and other culinary traditions are highlighted across multiple chapters in an exploration of what it means to be an immigrant in Iowa and how such cultures blend to create a far more ethnically diverse cuisine than many realize. Of all the observations and stories in the book, these wonderfully inclusive stories are among my favorites. This eclectic mixture of historical tidbits, social observations, vintage photos and delicious recipes provides just the right ingredients for a delightful reading experience. Maulsby, an Iowa native and lifelong food lover, has an obvious passion for her topic, and it pays off in this compact and charming book. She has worked across the state and Midwest for such diverse entities as Progressive Farmer magazine and the Iowa Turkey Federation. Maulsby has written in many publications about Iowa food, and it’s clear that it is a labor of love and a collaborative labor as Maulsby solicited tales input from all across the state for the juiciest food-related tales and locations. Even those who are well acquainted with Iowa food lore are sure to find something new and interesting. Ideal for anyone with a love of food history and particularly those with a Midwestern heart, this book has so many interesting tales, morsels of trivia and personal anecdotes that it feels as though the book should be twice as long. Go on an adventure with this fun, fascinating and tasty tale of culinary traditions that weave through Iowa’s past and present. Just be sure you have a snack handy.